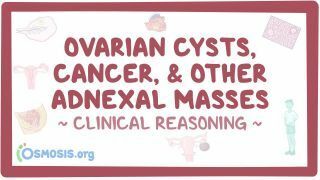 Osmosis: Clinical Reasoning: Ovarian cysts, cancer, and other adnexal masses. (2019, April 20). Retrieved from (https://www.osmosis.org/learn/Clinical_Reasoning:_Ovarian_cysts,_cancer,_and_other_adnexal_masses).